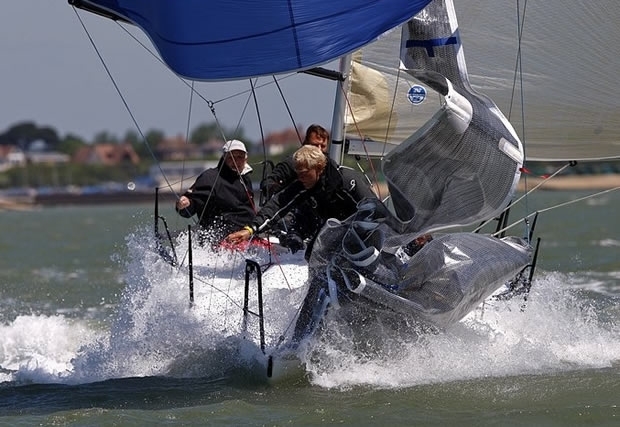 The eighth edition of the Coutts Quarter Ton Cup revival regatta will be hosted by the Royal Corinthian Yacht Club, Cowes, from 25-27 June 2012. The event will bring together Quarter Tonners from across the UK and Europe to enjoy three days of competitive sailing, camaraderie and fun. These historic mini race boat hold a very special place in the hearts of many sailors and each year more boats are rescued from neglect and brought back to their former glory by their enthusiastic owners. Owning a Quarter Tonner is a little bit like owning a vintage car and their owners put just as much time, money and love into rebuilding and maintaining them as any classic Bentley or Alvis owner. The original Quarter Ton Cup competition was raced annually from 1967 to 1996 and was the World Championship for small offshore racing boats. Many of today's top sailors and yacht designers cut their teeth in the class and a lot of the designs were truly unique and revolutionary in their day. Joining the Coutts Quarter Ton Cup revival fleet for the first time this year will be Peter Morton's new boat Bullit, a Fauroux design from 1977 which won the 1979 and 1980 Quarter Ton Cups and has just been completely refitted. Morty's crew will include Kelvin Rawlings, without whom the Coutts Quarter Ton Cup would not be complete, and Jules Salter who loves the event so much that he will fly in especially from the Lorient stop over of the Volvo Ocean Race, in which he is currently racing as navigator aboard Abu Dhabi Ocean Racing. Past ISAF Vice Chairman George Andreadis is also be returning to the Quarter Ton Fleet for the first time in 21 years with Atalanti IV, the boat he had built by Jeremy Rogers to Rob Humphries' design for the 1991 Quarter Ton Cup where she finished 6th. Atalanti IV has been in George's famous yacht storage facility ever since the end of the 1991 Cup, but she returns to the water this summer looking absolutely stunning following a full refit. Having just come second in the Quarter Ton Class at the 2012 Vice Admiral's Cup George will no doubt be hoping for a podium finish in the Coutts Quarter Ton Cup too. Class regular Rob Gray also has a new boat this season in the shape of Black Fun, a 1976 Laurie Davidson design which won the '76 New Zealand Quarter Ton Championship with four straight wins. Another new addition for the regatta will be Freres Sur Mer, a 1981 Fauroux design from the Netherlands. The Irish will be out in force with three new teams and at least one regular participant expected. The new teams are Paul Coulton's Cri Cri, a recently refitted 1979 Alain Jezequel design; Jason & Dominic Losty's Fauroux-designed Illes Pitiuses; and Diamund Foley who now owns Espada's sistership Anchor Challenge. George Kenefick and his young team aboard Tiger, the 1989 Fauroux previously known as ASAP, will also be crossing the Irish Sea once again to defend their Corinthian title for all amateur crews. The Corinthian Trophy was first awarded in 2011 and is expected to be hotly contested again this year. Joining the newcomers will be a host of familiar faces led by reigning Coutts Quarter Ton Cup holder Louise Morton and her crew aboard the 1980 Bruce Farr designed Espada. Also keen for a crack at the trophy will be Rickard Melander from Sweden sailing the 1990 Phil Morrison designed Alice II. Stalwarts of the Coutts Quarter Ton Cup, Rick and his crew have been gradually improving their performance each year and, having just won the Quarter Ton Class at the Vice Admiral's Cup, clearly have their sights firmly setting on the main event. Other regulars will include Graydon Dawson's Diamond, Willy McNeil and Mike Pascall's Illegal Immigrant, Ian and Catrina Southworth's Whiskers, Menace owned by Derek and James Moreland and Tim Rees, Paul Treliving's Odd Job and Paul Kelsey's Runaway Bus. With so many new teams joining the regulars an excellent turnout is expected. Racing will take place in the Solent with social events being held each evening at the Royal Corinthain Yacht Club's delightful Cowes clubhouse. The Coutts Quarter Ton Cup Gala Dinner will take place on Tuesday 26th and the guest speaker will be sailing legend Brian Thompson, who holds 27 sailing world records, has sailed more offshore racing miles than any other Briton and who will also be racing in the regatta with Rob Gray. Peter Burke, Senior Client Partner for Coutts commented: "Coutts is thrilled to support the Coutts Quarter Ton Cup for the sixth consecutive year. The regatta is an exciting and competitive event, attracting a loyal following and encouraging young people to get involved in the sport. We wish every racer the best of luck."